Slices of this apple-filled brioche served with cups of freshly brewed French roast coffee sent our spirits overseas to a sidewalk table at a cafe in France. Baking projects tend to be inspired by a single ingredient. Last week, two students gave me the biggest Granny Smith apples I have ever seen. They were a little bumped and bruised and seemed to be begging to be baked into something sweet. 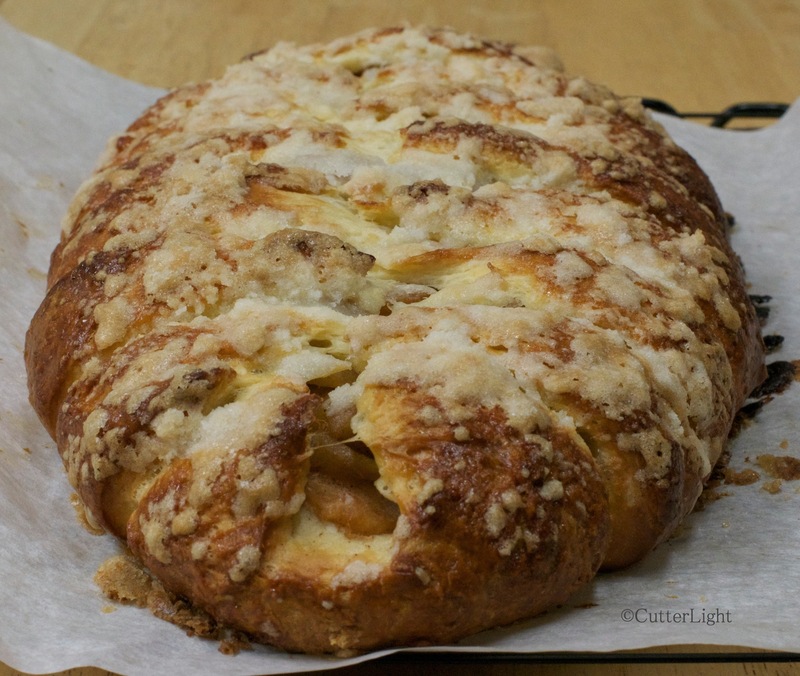 I remembered an apple brioche recipe I had wanted to try in one of the cookbooks we have in our library, Beth Hensperger’s Bread. Brioche is an egg-and-butter rich pastry-type bread dough which can be used in both savories and sweets. It produces a soft, moist bread and the dough is easy to make and easy to work with. Toss apple slices with lemon juice. Let sit for 1 hour, occasionally stirring. Place apples, sugar, water, and cinnamon in a heavy skillet and sauté until liquid is reduced and sugar is dissolved. Cool apple mixture to room temperature. Turn chilled brioche dough out to a lightly floured surface. Roll dough into a 10 x 15 inch rectangle. Spread cooled apple mixture down the center third of the dough rectangle. Cut strips 1.5 to 2 inches apart diagonally, almost touching filling. Starting at one end, fold strips over filling, alternating each side. You will have somewhat of a braided look when finished. Transfer bread to a parchment-lined baking sheet. Make topping by combining sugar and flour until blended. Cut in cold butter with a pastry blender (or food processor) until coarse crumbs are formed. Brush dough generously with beaten egg. Sprinkle topping on egg-washed dough. Cover loosely with plastic wrap and let rise at a cool room temperature until puffy and not quite doubled, about 40 minutes. Bake in preheated 350 degree F oven for 40 minutes. Bread will be browned and filling will be bubbly. In a bowl of a stand mixer fitted with a paddle attachment, combine 1/2 cup flour, yeast, sugar and salt. Add hot water and beat at medium speed for 2 minutes. Gradually add 1 cup more flour. When well-blended, add butter, a few pieces at a time. Gradually add 3/4 cup flour. Beat until thoroughly blended. Dough will be very soft and have a thick batter-like consistency. Scrape dough into a greased bowl. Cover tightly with plastic wrap and let rise at room temperature until doubled, about 3 hours. Refrigerate dough for at least 2 hours. Can be refrigerated longer or frozen for up to 2 weeks. Thanks. The topping adds a pleasantly crunchy texture. I just made a simple brioche loaf…I guess I need to step it up a notch. I love bread and apples, perfect! If you try this recipe, let us know how it comes out! It is in the process of raising as I type. I can’t wait to eat it!! It will be for Easter morning coffee. Happy Easter! And Bon Appetit! Yum! Can’t wait to try this…this is on our menu for this week! Oh my god! That looks so good. Must try it. Great recipe! I think I might fire up my oven! Thanks for checking in Cass! Negative 15 the past few days – nice to have a little comfort food.